If you are wondering, like I was, what the heck Soothex is it’s a solution of Boswellia Serrata Gum into Dipropylene Glycol which has been proven to reduce skin redness and irritation. Ceramides are found naturally in the skin and strengthen its barrier helping it to retain moisture. Hyaluronic Acid is huge in skincare for its light-weight hydration boosting capabilities. It can hold up to 1000 times its own weight in water. Sodium Hyaluronate is the salt form of Hyaluronic Acid which is actually considered to be more effective as it’s more compatible with the skin. Like I said, impressive! The consistency of the Simply Pure Hydrating Serum is that of a gel-lotion. It’s not at all runny but it’s still very light and sinks in almost instantly. It leaves skin feeling plump and soft and not at all sticky or greasy. One of the best things about it for me is how well it layers with my other skincare. I apply it before my moisturiser and never get any pilling which is my biggest skincare bugbear. It’s a great option if you are looking for something that you can easily slot into your existing routine to give you an added layer of hydration especially during the colder months. This also means that it can be used on pretty much any skin type. I have combination skin with an oily t-zone and I can benefit from the added hydration whilst it being light enough that it doesn't overload my skin. 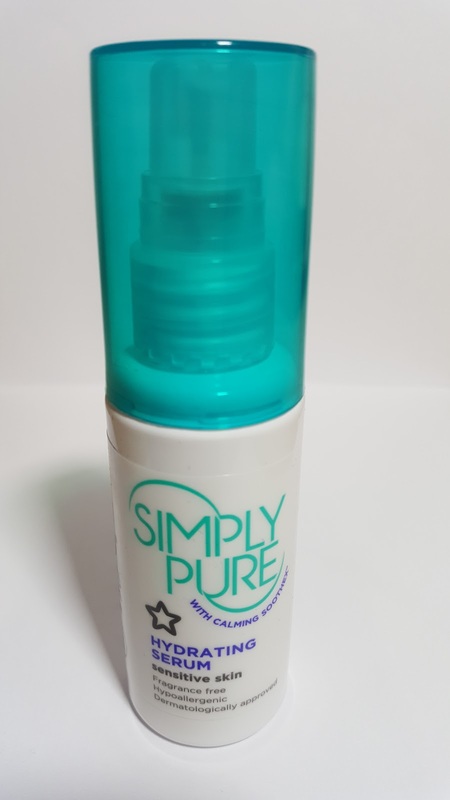 You might expect a serum this good to set you back at least £30 but at the time of writing the Simply Pure Hydrating Serum is just £2.99 for 50ml HERE! I can see myself picking it up whenever I see it in store just so that I never run out!